Micromeritics' Grant Selection Committee has selected the recipient of its grant award for the fourth quarter of 2010. 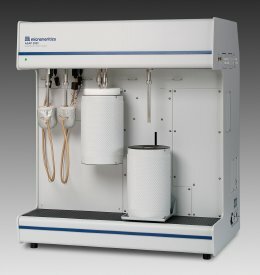 An ASAP 2050 Xtended Pressure Sorption Analyzer has been awarded to the Department of Chemistry at The City College of New York (CCNY), New York, NY. According to Dr. Teresa Bandosz, Principal Investigator, "Our research focuses on environmental applications of adsorption. It involves development of new materials working as effective media towards the adsorption/reactive adsorption of toxic gases, vapors and liquids. The ASAP 2050 will enable us to obtain full texture characterization (surface area, volumes of pores, pore size distribution) and thermodynamic (heat of adsorption). The ability to study small micropores using hydrogen as a probe molecule is a very valuable option. Moreover, the extended range of pressure will allow us more versatility in the evaluation of our materials, which we obtain, modify and test in our laboratory." Professor Bandosz has published 250 works in numerous peer reviewed journals and currently serves on the editorial boards of both Adsorption Science and Technology and the Journal of Colloid and Interface Science. She is also a member of the advisory board of the American Carbon Society. Micromeritics' Instrument Grant Program is intended to provide particle characterization instruments to non-profit universities and research organizations for the purpose of fostering and supporting meritorious research projects. A maximum of one instrument/integrated system will be awarded per calendar quarter. The next grant decision will be made prior to 03/31/11. The next application deadline is also 03/31/11 for a 06/30/11 grant decision.